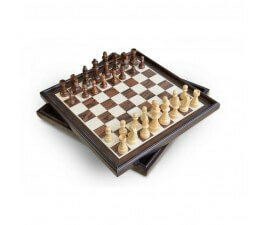 The classic game of Chess made with premium quality materials and packaging. Includes large wooden game pieces and a gold standard ultra-thick playing board, all inside a stunning gold-foil gift box. Large wooden chess pieces, Thick, durable playing board opens to 14.25” (36cm), Linen finish & Gold foil embossed gift box style packaging.